Happy Friday! Today's the last weekday before I start my new job! Eek! I'm a little nervous but also super excited. I think it'll make this whole move thing feel more like real life instead of an extended vacation interrupted by painful Ikea furniture building. Today I'm also excited to be able to share the awesome Foodie Pen Pals package I got this month. This was my second time participating in the program, and I was super lucky to be paired with the program's host, Lindsay of The Lean Green Bean fame. Lindsay is one of my favorite health and fitness bloggers, so getting a food package from her was kind of like getting a mix tape from Beyoncé. Seriously, go check out her blog if you haven't yet, she's amazing!. -Organic pumpkin seeds: I am pretty pepita obsessed and have been throwing these in all my salads and stir frys. -Pecan Pie LÄRABARs: Ok so all LÄRABARs are pretty good but these are amazing! -Bragg's organic sprinkle seasoning: Haven't tried this yet but it smells great. 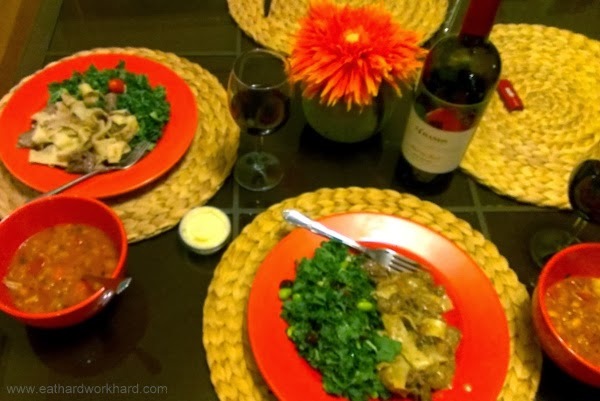 Thinking it will be perfect to season my next batch of slow cooker shredded chicken. -Bean Good organic bean pasta sauce: This pasta sauce includes blended white beans, upping the protein and fiber content. Sounds weird but it's actually tasty and not bean-y at all! -Justin's nut butter packs: Perfect for travel. -Marantha sunflower seed butter: I'd never tried sunflower seed butter before but I love it and now I can't stop eating it! -Pistachio packs: These were great for healthy snacking during our road trip. Thanks so much for the generous and delicious package, Lindsay, and for running such an awesome program! I'm a huge fan of the Foodie Pen Pal experience and highly recommend it to anyone who's considering signing up for the next exchange. If you'd like to join in February, click here to learn more and sign up by February 4th. Now excuse me while I go eat some more toast with sunflower butter. Since one of my January goals was to try a new fitness class in Santa Barbara, I took advantage of the fact that I haven't started my new job yet to try a barre class for the first time. And since my other two goals were to successfully move cross country and stay somewhat active during my road trip, my list is totally checked off. With two whole days left in the month! Such an over achiever. 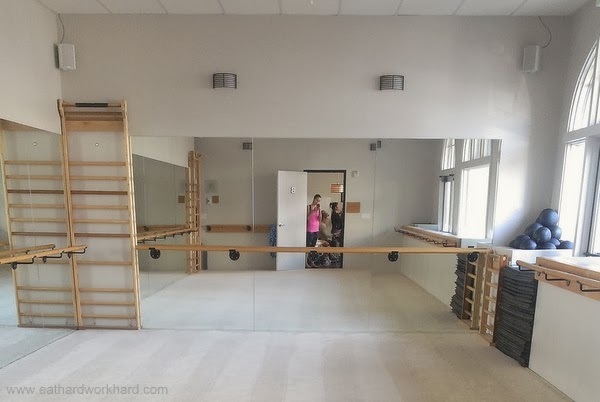 I'd never taken a barre class before a few hours ago and didn't really know what to expect. So for anyone else who's new to barre, here's a Workout Wednesday review of the mixed level class at Barre 101. Right before starting my road trip, I saw and almost bought this Groupon for Barre 101. According to the website, Barre 101 is "a 60 minute, total body workout that incorporates a cardio element..We leave no muscle un-toned and burn tons of calories by keeping your heart rate elevated." That sounded right up my alley, and five classes for $49 seemed like a great deal. But just to be safe, I decided to pay for a class at full price first to see if I liked it and headed over to the mixed level class with Brie this morning. Barre 101's Santa Barbara location (they have another in Agora Hills) is right down town. There isn't a sign, so it's a little hard to find. There's also no parking lot, but there's a big garage right next door at Ortega and Chapala with plenty of free 75 minute parking. After walking in, I checked in at the small reception desk and was directed to deposit my stuff in the small bank of lockers. Oh and since this class asks you to wear socks but no shoes, I also changed into what I thought was a very presentable looking pair. Turns out I was only half right. Oh well. There are two barre rooms on either side of the reception desk. Both have mirrors on three walls and a big bank of windows on the fourth, and plush wall to wall carpet. I've never seen a dance or fitness studio with carpet before so it was a little weird but very comfortable. The class started right away with a few high knee pulls to warm up, a set (the first of MANY) push ups, a plank, and upper body work using two and three pound weights. It reminded me of a Blogilates arm workout. 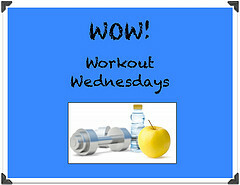 Think tiny movements, many reps, and burning muscles. It was kind of weird to jump right in without any introduction or chit chat from the instructor, but she did identify the new people and walked around asking names during the set. After arms we moved to the barre for the first set of lower body work. Lots of calf raises and plie squats in different positions. Definitely worked some unfamiliar muscles, like the small muscles right above my knees, and my legs were shaking by the end. After the first set of leg work, we did some more leg work on the floor, then went back up to the barre to for some arabesque leg lifts, then finished back on the floor with some pilates-esque core work. The transitions were fairly fast and accompanied by some quick stretches and lots and lots of push ups. After we finished with a brief stretch I could definitely feel the workout in my muscles, especially in my legs, but I wasn't sweaty at all. Burn: I definitely hit a lot of muscles that I rarely work/didn't even know I had. I'm sure I'll feel it tomorrow! Variety: We went through a ton of transitions to lots of different exercises so you weren't stuck and bored at the barre for an hour. Atmosphere: The instructor was supportive and helpful. The studio has lots of natural light and the music was great--upbeat but not distracting and no top 40. Overall a great environment for a class. 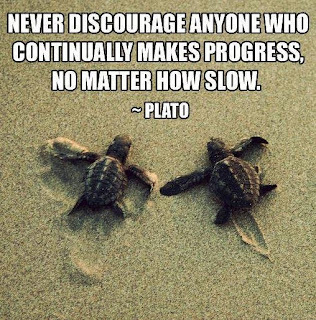 Learning curve: The transitions were fairly fast and the instructor didn't always demonstrate the exercises. I definitely felt a little rushed and confused a few times and unsure about form. She was great about going around and correcting, but because of the layout it took her awhile to get around the room. Intensity: Even though the Barre 101 website says it's a cardio workout that burns "tons of calories", I didn't find that to be the case. I never got out of breath or sweaty, and according to my heart rate monitor I burned just under 200 calories during the hour class. Fun factor: In spite of the variety of exercises and good atmosphere, the focus on lots and lots of the same small movements wasn't super enjoyable for me. I'm really glad that I tried this before buying the Groupon, because I don't think barre is for me. I appreciate the burn I got from working muscles I forgot existed, but I just don't enjoy all those reps of small controlled movements and don't get a lot out of doing them in a group setting. Q: Have you ever tried barre? Love it or hate it? What's your favorite fitness class? 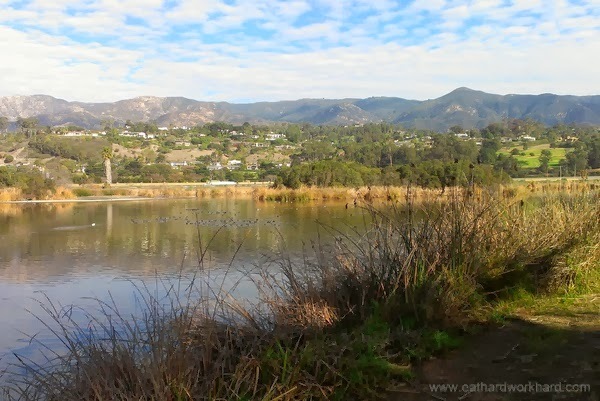 Weekend Highlights - First Weekend in Santa Barbara! I spent the weekend hanging out with the bf and am still getting moved in, so I don't have a meal prep post for you this week. 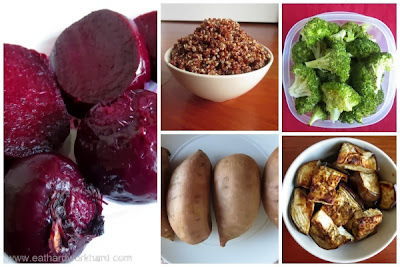 If you're in need of inspiration, check out my previous meal prep posts here. I'm spending today in LA dropping the bf off at the airport, visiting friends from college, and making an all-important Ikea run. 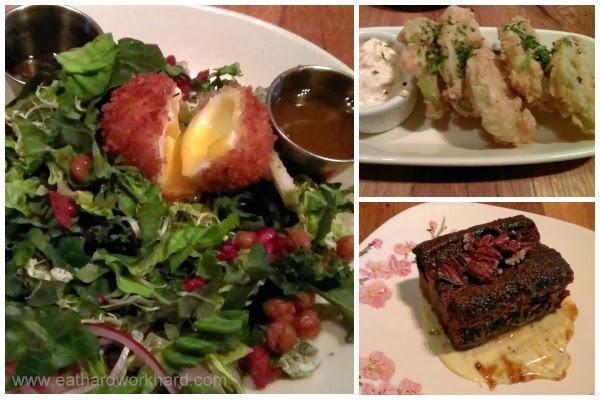 I'm really sad to see the bf go, and almost just as sad to be driving to LAX at 4:30 am (I kid), so I'm drowning my sorrows with a recap of our fabulous first weekend in Santa Barbara. 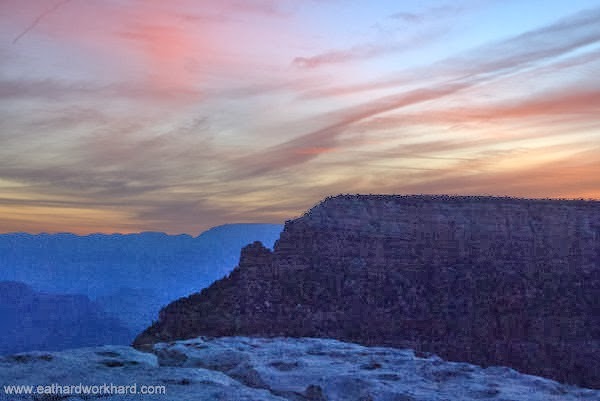 On Friday, we woke up super early for sunrise at the Grand Canyon. It was incredibly beautiful and moving. We didn't have time to go down past the canyon rim, so that's definitely still on my bucket list. I'd love to do a long hike there, although maybe when it's a little warmer! After leaving the Grand Canyon, we drove the last 9 hours to Santa Barbara and arrived at my new place around 8 pm. We were pretty exhausted, so after meeting my new housemates and eating our first meal in the new house (healthy-ish grab and go food plus a bottle of wine from Trader Joe's) we barely got the bed set up before falling asleep. Saturday morning was sunny and beautiful so we took an early morning walk along the beach to the Bird Refuge. We ended up walking around 5 miles, and the great weather and amazing views was an awesome introduction to Santa Barbara living. After stopping for a yummy bagel and latte at Jack's Bistro, we showered and headed out to explore the Urban Wine Trail. The Urban Wine Trail is a collection of over 20 wine tasting rooms and even some production facilities, all located close to downtown Santa Barbara. Most of the wineries are clustered in what's known as the Funk Zone, a cool former industrial area that is now occupied by artists, restaurants, bars and wine places. We had some good wine and some not so good wine. 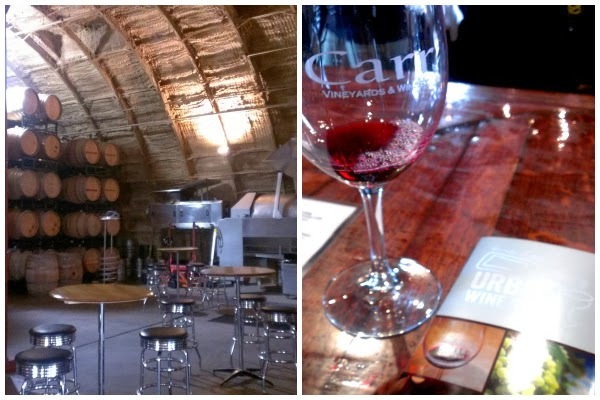 Carr was by far and away our favorite, and their tasting room is also really cool and offers views of the production facility. It's a little far from most of the other stops (and dangerously close to my house) but definitely worth the trip. And overall we just enjoyed the kind of laid back, fun wine culture on the trail and that it was all within (fairly long) walking distance from my new place. We took a break from wine tasting for some awesome fish, al pastor, and tongue tacos at a little hole in the wall called Mony's. Then, for dinner, my new housemates took us to one of their favorite Mexican restaurants. 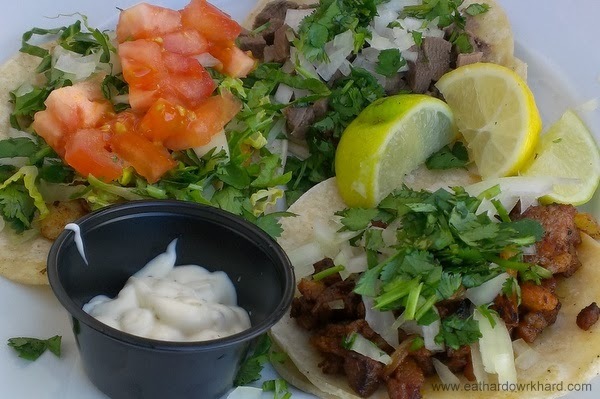 I can tell already that the abundance of good Latin food is one of the things I'm going to like about this town! Sunday morning was rainy and cold (ok by cold I mean low 50s). The bf had to catch up on some work, so we packed up our laptops and headed to Coffee Cat downtown on my housemate's recommendation. 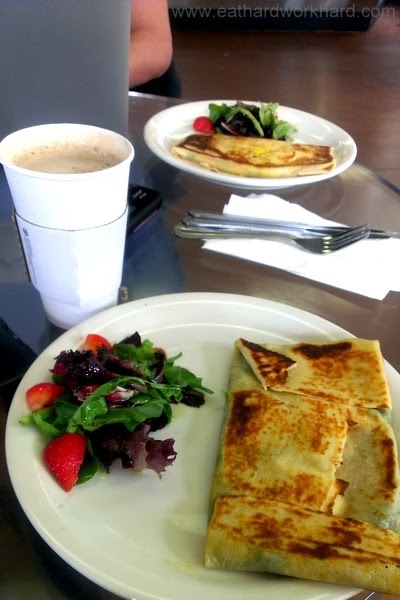 My caffe au lait and crepe were delicious, and it was the perfect place to spend a rainy Sunday morning. After spending a few hours working/blogging/picking out Ikea furniture, we took a walk up the Courthouse viewing tower and down State Street, which was still bustling despite the somewhat dreary weather. 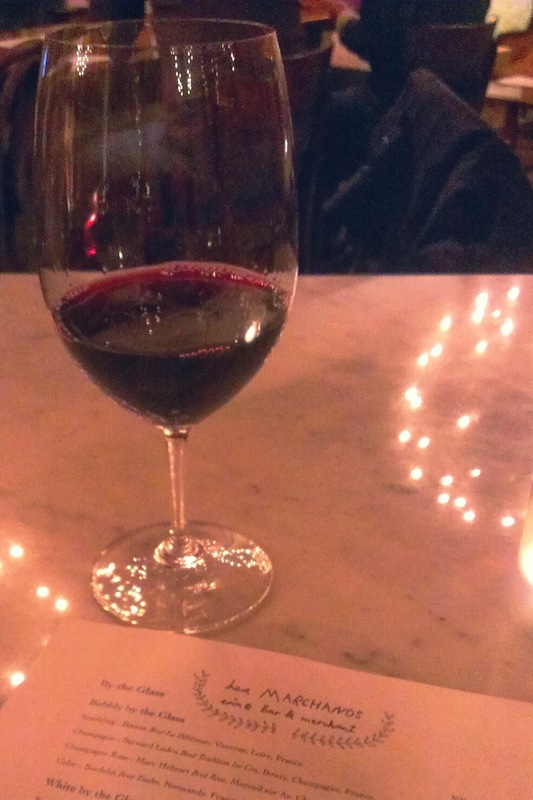 We ended the night with a truly amazing meal at The Lark and more wine at Les Marchands, the neat little wine bar next door. Then it was off for a little True Detective (soo good but so freaking scary!) in bed and a couple hours of sleep before heading out to the airport at 4:30 AM this morning. Q: How was your weekend? Any advice for things to do your first week in a new city? Preparations are slowly but steadily moving forward. 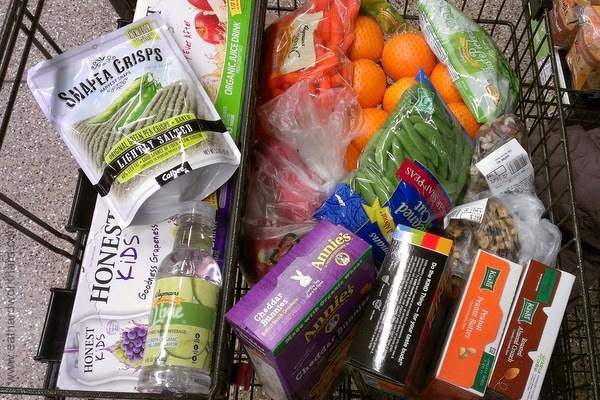 I've added 3 trash bags of clothes to one box, got my car serviced, and bought a bunch of healthy road trip snacks. 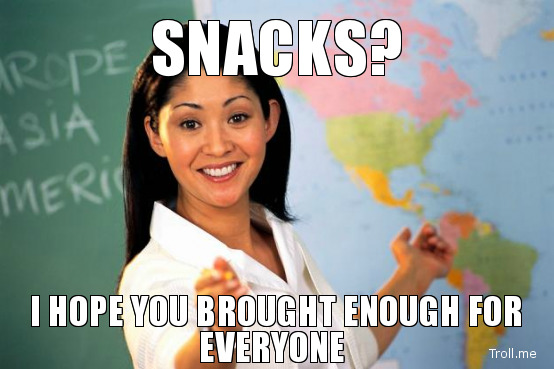 Have snacks will travel! 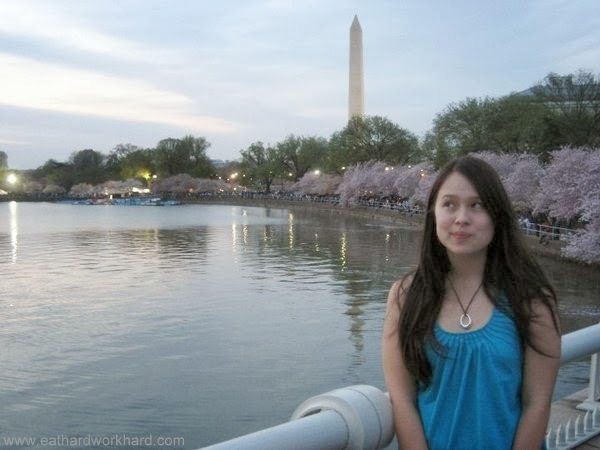 To commemorate the last Friday before my big move, I'm joining the DC Trifecta Friday Five and Fitting it All In's Five Things Friday Link Ups with five thing's I'll miss about living in the DMV. DC has a a TON of museums and monuments, and most of them are FREE. Free culture is awesome! Yes they can be crowded with tourists and, like most people who live here I didn't go down to see them as often as I could have. 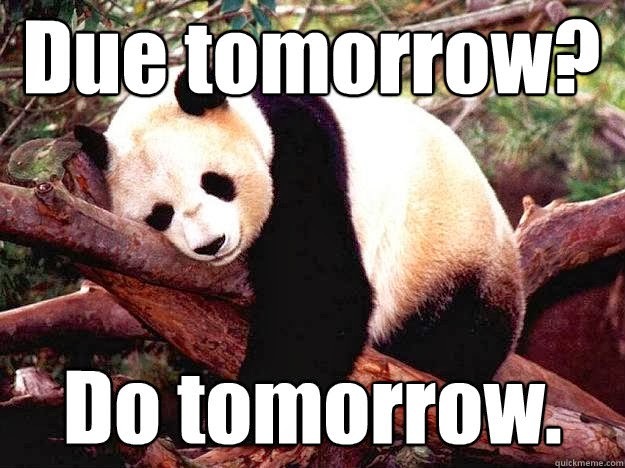 But I'll definitely miss able to run past the Washington monument or visit the latest baby panda cub whenever I want. People from all over the country and the world settle in the DC area. Not only does this mean a lot of interesting conversations, it also means a wide variety of awesome restaurants. 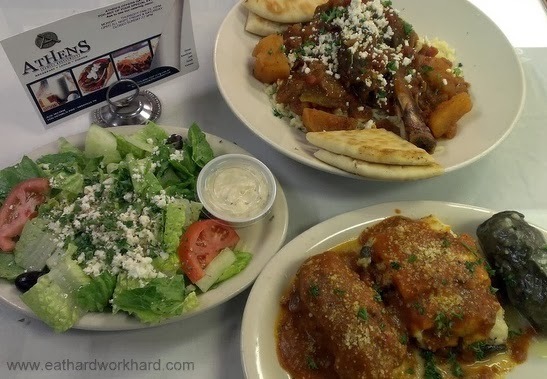 You might have to head out to the suburbs to find the best and most authentic meals, but almost any cuisine you could possibly think of is a metro or quick car ride away. The DMV also has an awesome variety of neighborhoods, from hipster mecca H-street to historic capital hill to awesome, accessible and affordable Arlington where I've lived for the past 3-4 years. DC weather is nothing to write home about and Santa Barbara weather sounds amazing (high of 79 today! ), but I will miss our four distinct seasons, especially snow. Snow will still be a car ride into the hills away in Santa Barbara, but I'll miss having grown up snow days off work when the DMV's south-of-the-Mason-Dixon-line snow clearing services are paralyzed by 2 inches of snow or "wintry mix". Call me crazy but I'm really going to miss the metro. Yes it's constantly running late, stops running super early, has seldom-working elevators and escalators, and goes way less places than NY's subway. But it is comparatively clean and safe, and moving from a city with a subway system to one without definitely makes me appreciate it more. 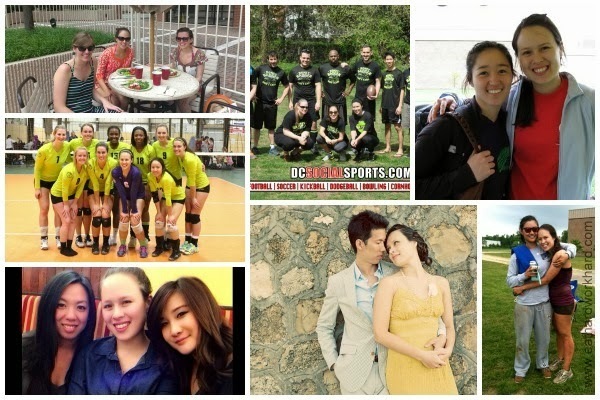 Of course, the thing I'll miss most about living in the DC area is all my family and friends. 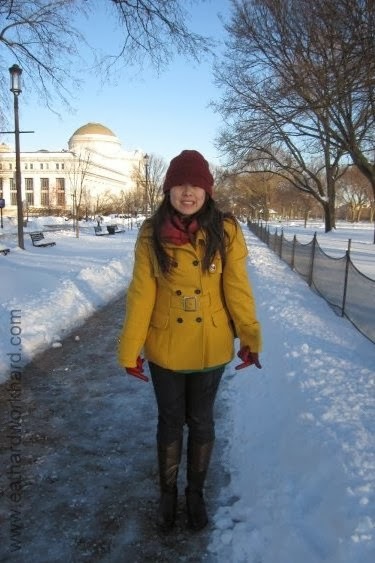 I grew up in a Maryland suburb and have been living in DC and Arlington since I came back from my grad program in China 5 years ago. I know we WILL keep in touch, but I'll miss being so close to all my family and the awesome friends I have here (not to mention the bf), the most. Ahh ok tearing up, must stop now. Q: What do you love most about your city? Today is my LAST DAY at work! Plus I found a place to live and signed a lease! And the bf and I set a departure date of Monday for our cross-country road trip and bought his return ticket. So this this is really happening! 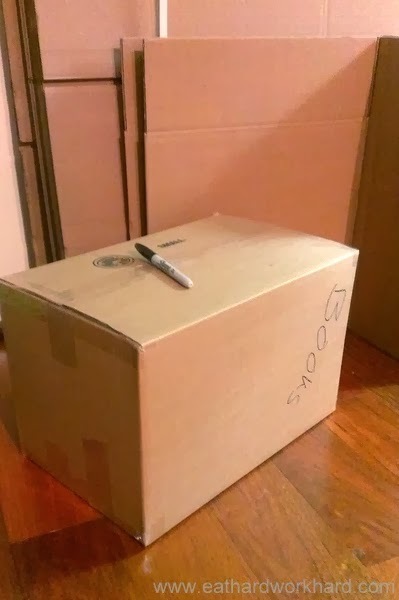 Oh and I have packed exactly one box. 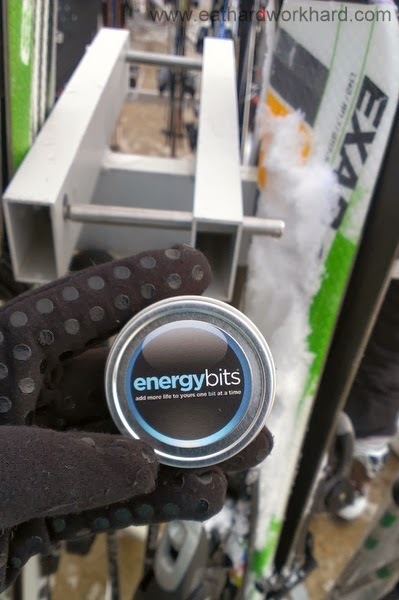 Along with the themes of changes/new things, I have a review of a great new sports nutrition product: ENERGYbits. ENERGYbits sent me a sample of their product for review and I tried twice. The first time was during our New Year's ski trip. After skiing (and drinking a lot of champagne) New Year's Eve, I definitely needed something to get me through another 4 hours of cold, unfamiliar exercise the next day. According to the instructions on the package, you're supposed to swallow 30 tabs 10-15 minutes before your workout. 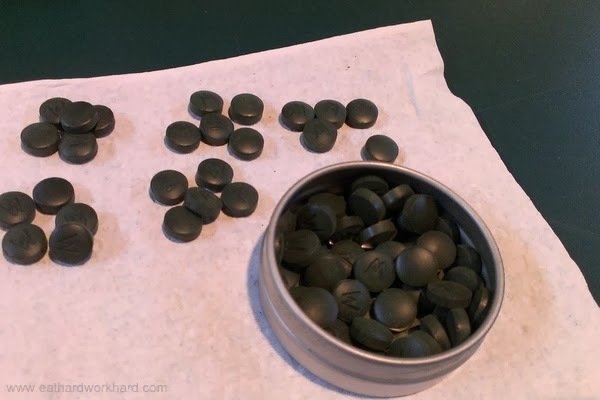 You can also chew them, but the container says they taste very 'green' and they don't smell like you'd want to try it. They didn't taste like anything when swallowed, although it was a bit of a pain to count out and swallow all 30 tabs. It was a little hard to tell if they made a difference, since I don't ski very often/well, but I did manage to keep going down the second easiest green hill the whole day! 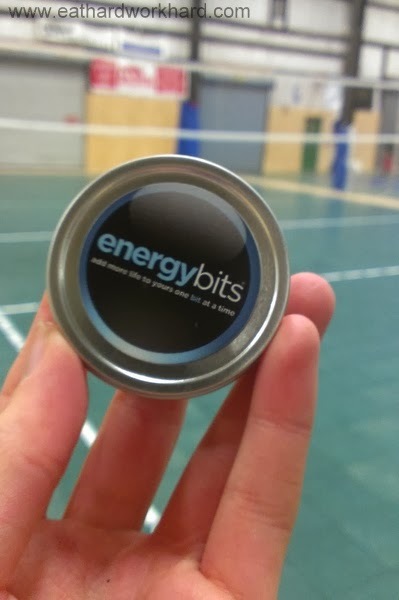 After my ski experience, I decided to evaluate ENERGYbits in a more familiar environment: the volleyball court. Volleyball tournaments normally last 8 hours plus and include 4-6 matches. It's hard to stay fueled, no matter how good you are at eating during breaks, and I'm often really shakey by playoffs. I've started using energy chews, which work really well but tend to have a lot of sugar and scary ingredients. I took my 30 tab dose of ENERGYbits about 10 minutes before playoffs when I was totally wiped and shaking so much I had trouble taking this picture. Well, I can definitely say that they worked just as well as the chews and I felt totally fine energy-wise for all of the semis! We unfortunately lost (maybe should have given ALL my team bits lol), so I'm not sure how long the energy lasts but I was very happy with the effects. Price - I know the price per serving is comparable to other sports nutrition products, but spending over $100 at once on a food product is not something I'm used to. I'm cheap! 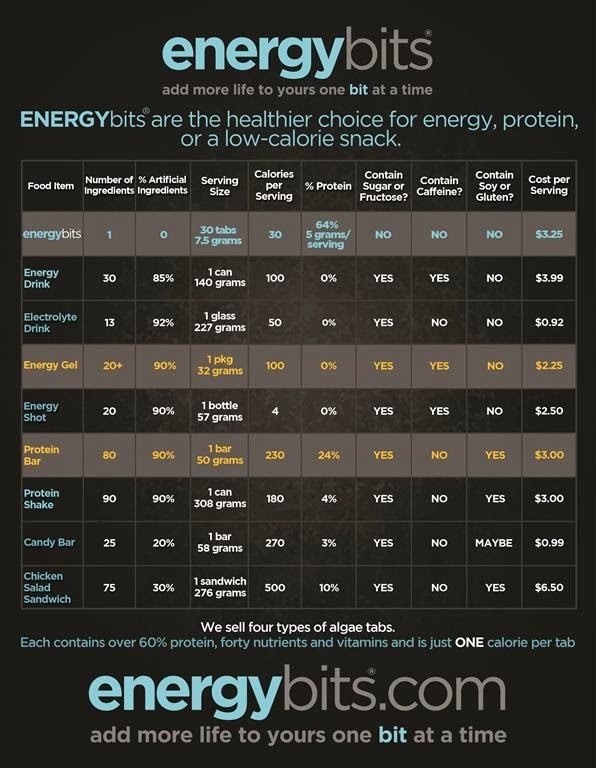 ENERGYbits are a little pricey and it isn't the easiest thing to count out and swallow 30 tabs. But, if you often find yourself in situations where you run out of energy and need more fairly fast, the awesome nutritionals would make the costs and effort worth it. ALSO,one lucky reader will win a sample of ENERGYbits to try for themselves! To enter, leave a comment below telling me why you’d like to try ENERGYbits. 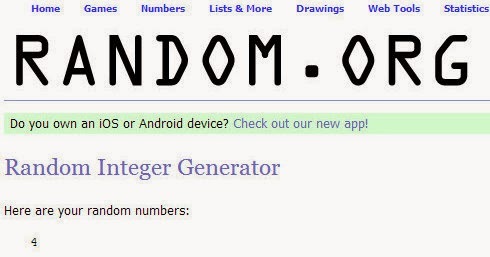 I’ll choose a winner via random number generator (sorry, US residents only!) next Wednesday morning, 1/22/14, at 9:00 AM. 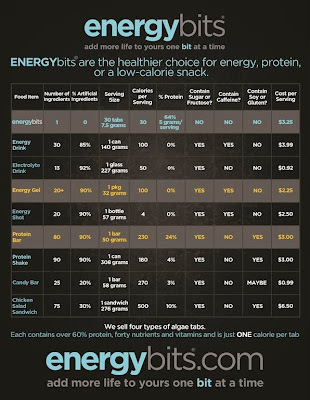 Disclaimer: I was provided a sample of ENERGYbits free of charge for review. First time ever that's happened! All opinions are solely my own. Ahh today is my last Monday at work! Everything is moving so fast! I still haven't started packing, although I did pick up a bunch of boxes and packing supplies. 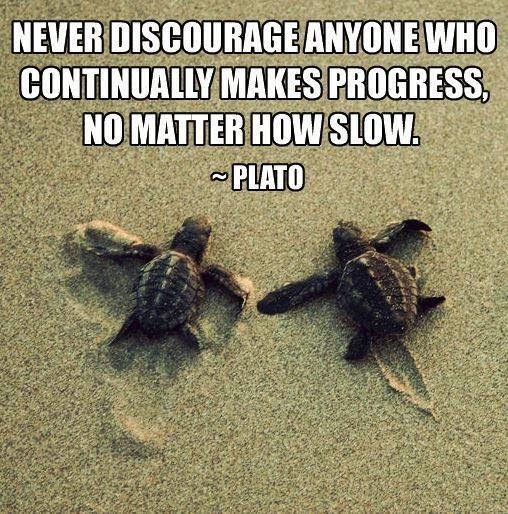 So, progress! I have a few going away lunches and other festivities, so I kept this week's meal prep simple and light. Something about winter makes me craved baked good, so it's been a long time since I've made overnight oats. I almost forgot how convenient and tasty it is! To keep things light, I went with tofu as my main protein. To keep it interesting, I cubed and baked the tofu following these instructions (minus the option marinating) from The Kitchn. Crispy on the outside and chewy on the inside, this is definitely a big difference from normal raw tofu! To go with the tofu I cooked a ton of veggies and some quinoa. It was my first time making beets, and it was really easy! I followed these instructions, also from The Kitchn to roast them. Along with the beets, I also roasted some eggplant and sweet potatoes, and boiled the broccoli since all my baking sheets were occupied. Still trying to hit that Run This Year goal so I'll be sticking to my 10K training schedule. Only 350.5 miles to go! Hope everyone is having a happy Friday! I'm in full panic mode because I'm moving in less than two weeks and I still don't have a single box packed or a place to live. Oh well. I managed to pack my entire dorm room from a year of grad school in China in the 2 hours from 6-8 AM when I had to leave for my flight back to the US. 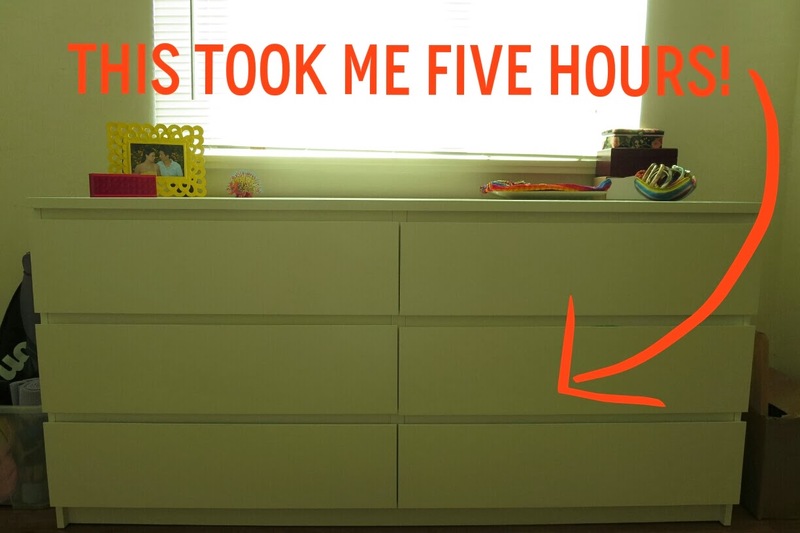 So I have tons of time! I'm also fairly convinced that I will have no friends in Santa Barbara except for Netflix, the internet, and food after I get there. Oh and alcohol! "I saw your blog post on moving and not having any friends, and it made me think of how I felt when I moved down to Atlanta without knowing a single person. 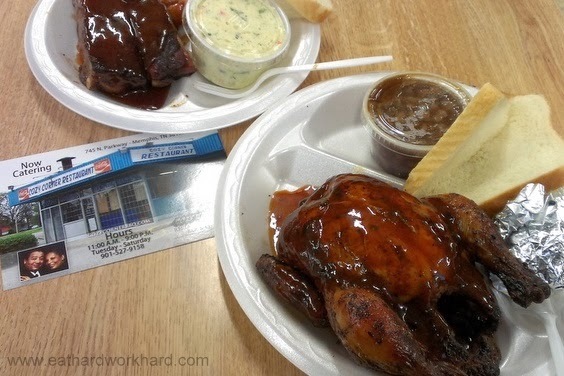 So I started googling Santa Barbara and found some things similar to what I did in Atlanta...I apologize if you don't want this unsolicited information, but I thought that maybe it might be useful." After reading my friend's suggestions (thanks SO MUCH Andrew!!) 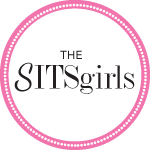 and a little googling, I'm joining Fitting it All In's Five Things Friday Link Up with five ways to make new fit friends in a new city. So you don't end up alone, watching Downton Abbey on your laptop with a bottle of wine and block of cheese for company. Meetup.com claims to be the world's largest network of local groups and it is super easy to find and join meetups for almost any interest. So far, I found meetups in Santa Barbara for beach volleyball, running, hiking, yoga on the beach, and survivors of near death experiences. I've never had a running buddy, but since I'm going to really run this year I figure it's a great time to make running friends. Santa Barbara unfortunately doesn't have a Road Runners Club of America, but I was able to find a group using this Find a Running Club tool from Running in the USA. Social sports are a great way to meet people and are usually less awkward than chatting up strangers at a party. Being on a team gives you a built-in group to interact with at least once a week, and something in common to talk about during any team happy hours or other social events. With an extensive national network of leagues, Waka Kickball is a good place to start, and most leagues let you register as a free agent. 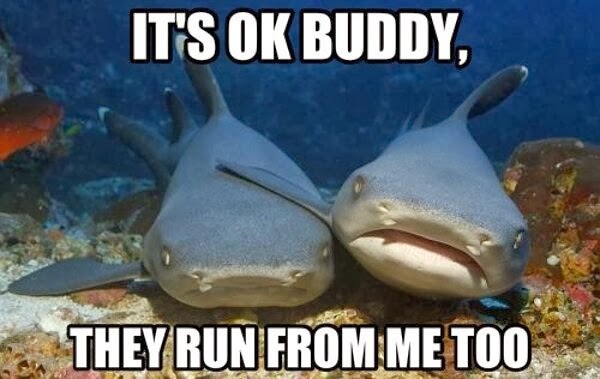 I've never made friends at regular gyms, but CrossFitters are supposed to be a really tight-knit community. You can find a CrossFit location here. While not fitness related, Andrew says volunteering is a good way to meet people because "it's less like a young adult hookup club and the people seem to be generally nicer and more genuine (unless they are doing community service against their free will)." VolunteerMatch is a great site to find places to volunteer in your city sorted by cause area. Admittedly, finding all of these opportunities to make friends is the easy part. 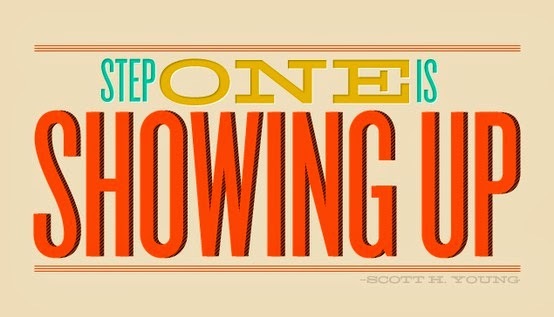 But to actually make friends, you have to take the next step--showing up. When I moved to DC, I joined about 10 Meetup groups but to date have not been to a single meetup. Ever. So something to work on this time. Q: Any tips for meeting people in a new city? Have a place for me to live in Santa Barbara? Guess what?! 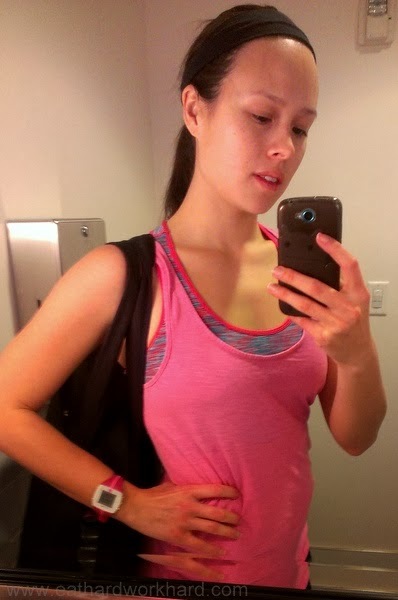 I completed a treadmill run that I REALLY ENJOYED yesterday! And I felt FAST!! All thanks to this wonderful 6 x 400 treadmill interval workout from Carrots 'n Cake. 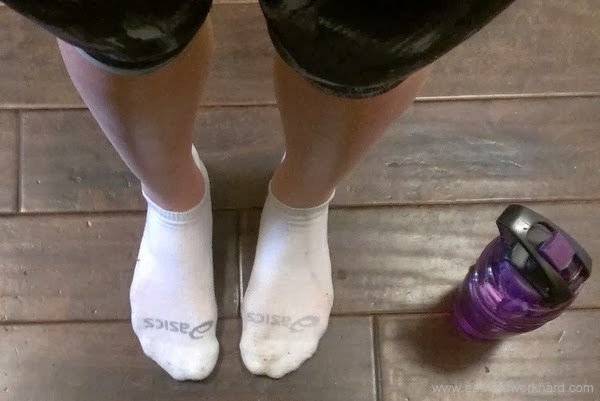 I didn't do all my intervals at 8.5, but I finished there and my body doesn't feel terrible (yet). In fact, I think I can definitely run it faster next time! Feeling pretty good about hitting my Run This Year goal. 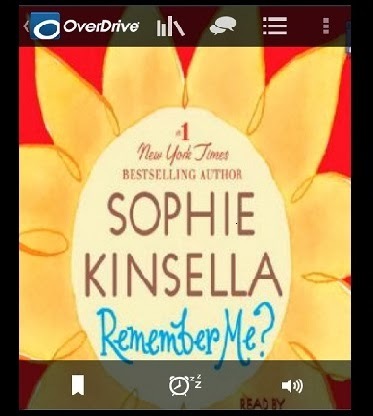 Oh and I finally figured out how to download and play audio books from the library on my phone. I didn't want anything too serious, so I checked out my first Sophie Kinsella book thanks to a rec from Fairytales and Fitness. Definitely helps the treadmill time pass! Despite my current cockiness confidence in my ability make my Run This Year goal, 365 miles is still a lot more than I've ever run before. 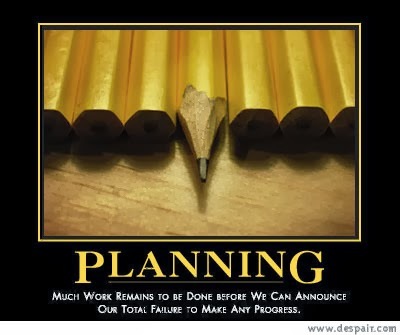 So a plan would probably be a good idea. Jell Galloway is a former US Olympian and the creator of The Galloway Run-Walk-Run Method. This method was designed to help beginners start running with strategic walk breaks. 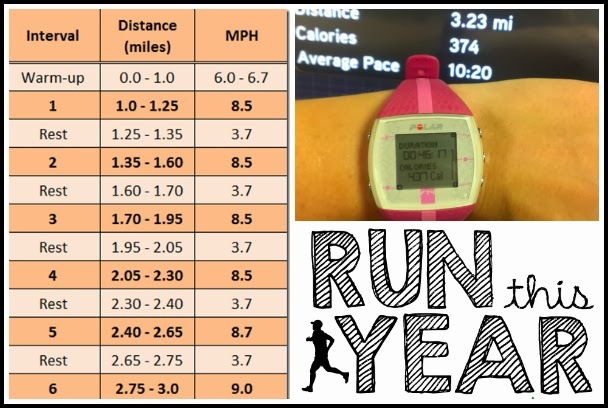 The website includes a free 5K and 10K training schedule and a tool called the magic mile prediction tool to help you find your ideal run/walk ratio. Hal Higdon is another BIG name in the running world. Even I've heard of him! He's contributed to Runner's World magazine since 1966 and has written 36 books, including Marathon: The Ultimate Training Guide. Hal's website includes TONS of training schedules. Love that the 10k training guide has a novice, intermediate, advanced, and walk option. Cool Running's been around since 1995 and claims to be the longest-running commercial site dedicated to the sport of running. 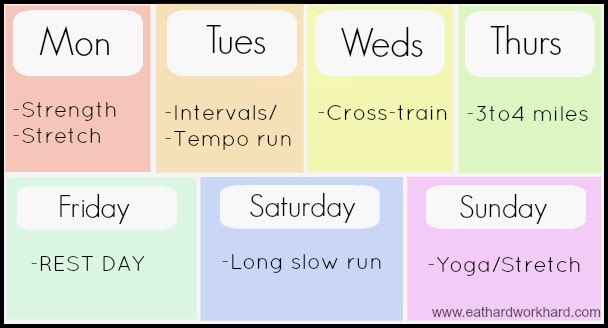 They have a great Couch-to-5k running schedule and a lot of resources for beginners, as well as 10K training schedules for beginner to competitive runners. The plans include a LOT of running, although mostly at an easy pace, and no cross-training. 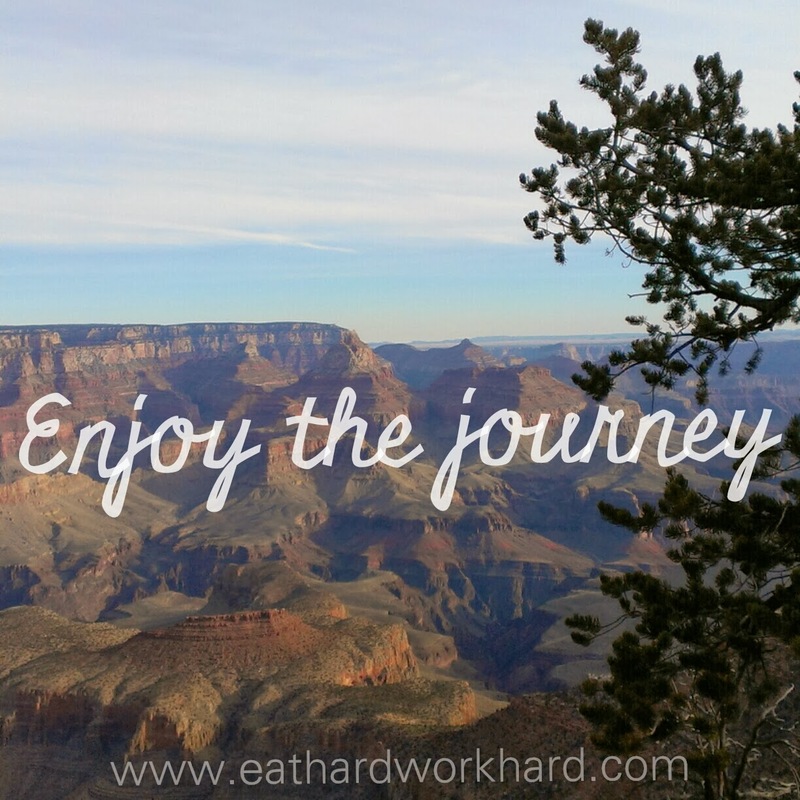 It includes 3 days of running: A long slow run, a fairly easy shorter run, and one run which will alternate between some kind of speed intervals and a tempo run (a continuous run with a buildup in the middle to near race pace). The other days I'll do a variety of cross-training, including yoga. I may switch days around a little bit due to schedule conflicts, but I want to stick with this as much as possible for a few weeks to see how it goes. Q: Are you training for a race? Any suggestions for good online race training? Know of any good 10Ks near Santa Barbara?